Our first “flash” of the season finds Officer Ben Sherman running full throttle through a dirty alley then jumping a fence in pursuit of a suspect. This would be one of many difficult situations he would encounter on his typical Wednesday. 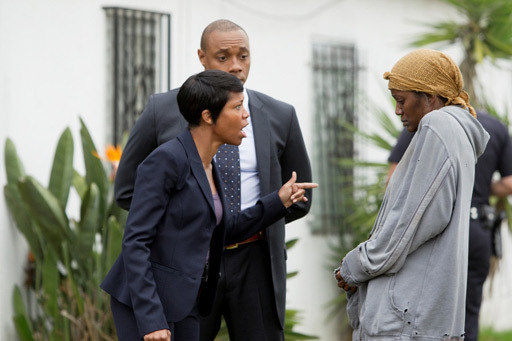 Welcome to SouthLAnd, season four. 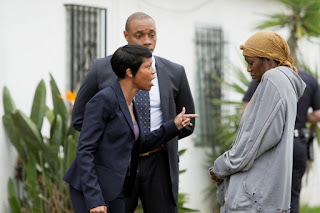 Detective Lydia Adams (Regina King) begins her Wednesday with an unexpected visit from a former high school acquaintance, DaNelle (played by JoNell Kennedy). In the past, DaNell had been Lydia's CI and still seems to be unable to stay out of trouble. The comparison between Lydia and DaNelle is drastic. Accomplished detective and addicted user. How sad is it that DaNelle has lived in LA her whole life and never seen the ocean? Lydia is also establishing a partnership with Ruben Robinson, a former Marine and street cop turned detective trainee. There is a natural flow of conversation and the acknowledgement of who is in charge between the two. Officer Ben Sherman (Ben McKenzie) is enjoying the bachelor life and his new rank of P2. He appears confident in this new role, even to the point of lying to a group of gangsters so they will clear a path through a yard for him to continue pursuit of a suspect. "I earn what they pay us and I do the damn job the way they taught us" he tells veteran officer Danny Ferguson (Guest star Lou Diamond Phillips) during a heated exchange over how a crime scene and victim were handled. The Boot has definitely grown up into a full fledged member of the LAPD. P-3+1 John Cooper's (Michael Cudlitz) Wednesday begins at the gym where we are introduced to the now physically fit and recovered former FTO. His new partner is P-3 Jessica Tang (Lucy Liu), dealing with job related issues of her own. She's a bit quirky; not turning left on Yucca and always eating at Truck Norris on Wednesdays. Cooper shows his cop intuition is still intact by giving a stern look to a man at a sidewalk cafe: the man who would turn out to be the gunman in the police station shootout. We see Cooper do things we haven't before - run, jump into a car ("I hope the pins hold") and walk and bend without pain. And in those activities, as in every scene he is in, we see the subtle joy in Cooper's face at being back on the beat. Officer Sammy Bryant's Wednesday (Shawn Hatosy) shows us in his role as a single dad; talking with Tammy on the phone. When a car pulls up next to Sammy and his son, Sammy becomes concerned. The car is revving it's engine and staying parallel to Sammy's car. 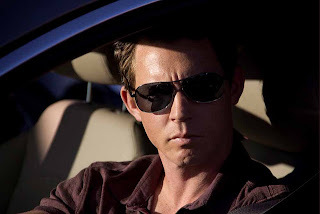 The driver leans over and asks Sammy if he remembers him. Sammy thinks this could be a banger from his days in Gangs and slowly reaches for his gun. Then the other driver tells Sammy his name and says they were in the Academy together. Sammy is so relieved, he has to pull over. Bryant seems to relish being back on the streets far more than being a detective. And his partnership with Sherman seems to be a good fit. Officer Dewey Dudek's Wednesday shows us he is still his same loudmouth self; both inappropriate and sexist. He calls Officer Tang, Pootie Tang or Hollywood, and uses a stereotypical Chinese accent when talking to her. "Head into the light, brother. Oh, there is no light where you are going" Dewey says to a dying gang banger. A typical Dewey observation and quip. SouthLAnd is noted for its cinematography, directing, writing, attention to police procedure detail, and acting. This episode is brilliant yet again in all those categories. The hustle and bustle of Los Angeles is captured with the famed guerrilla style of filming, with legendary DP Jimmy Muro using lens flare more sparingly but capturing in one scene the dusky setting sun over the Pacific with perfection. The writing is flawless; the banter between partners is sharp and witty, making the viewer long to hear much more of it in future episodes. There is always a touch of humor in every SouthLAnd episode; Mr. Milsap and his pantyhose supply it in this one. The ensemble cast is truly, truly one of the very best on episodic television. Tuesday night's TV schedule is crowded. ADD THIS SHOW. Watch it live at 10pmEST on TNT, the reairing at 1:00amEST, DVR it, watch online at tnt.tv or purchase it from ITunes. It is that good and not to be missed.